If you didn’t visit Spectrum Fantastic Art Live 4 in Kansas City a few weekends ago this artwork will be new to you. 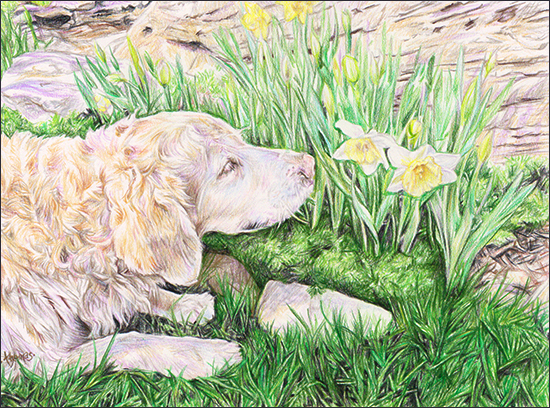 Spent two weeks before the show and finished 6 new colored pencil illustrations which are shown here. Also added an illustration that was done for an Artorder contest. If anyone is interested in any of the artwork please let me know and will send you the price. All the artwork is matted and ready for framing. When doing the new illustrations did super rough sketches that are barely recognizable but more for layout and flow purposes. Also want to say that sitting down and working on these sketches and drawings for Spectrum gave me a freedom that I haven’t experienced since childhood. Creativity and experimentation were in full force. 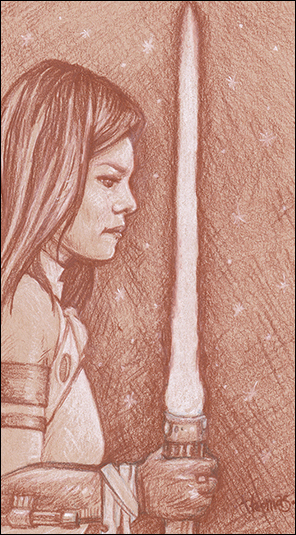 Jedi Woman -Wanted to do a star wars piece but wanted it to barely relate to star wars. So made this young jedi woman holding a light saber. This was a very quick drawing. Used toned paper with a burnt sienna colored pencil and white pencil. The size of the illustration is 4.5 x 8 inches. 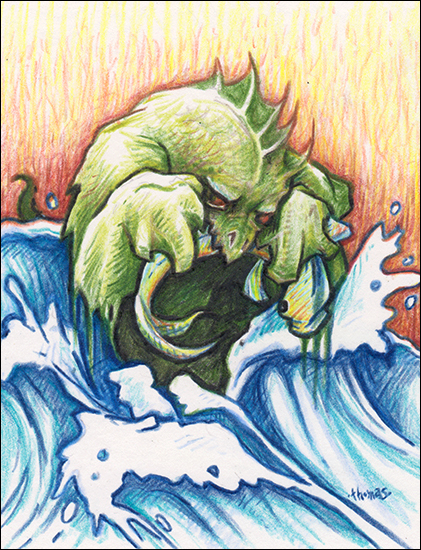 Godzilla – Next illustration that I did was a creature that was breaking thru the water with a giant fish in it’s mouth. Very Pacific Rim inspired. Ended up being more like Godzilla. 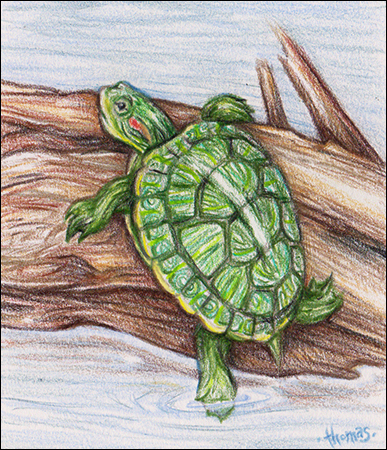 The size of the colored pencil artwork is 3.25 x 4.25 inches. 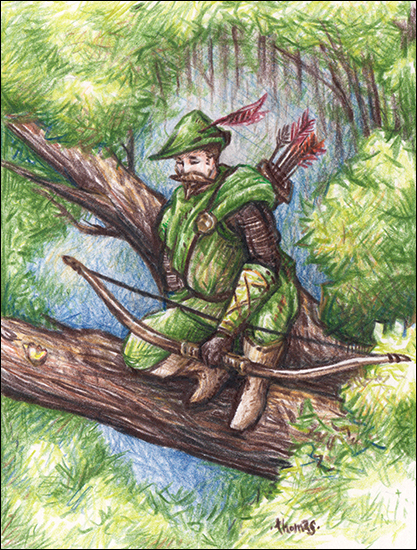 Robin Hood – This image changed drastically and was originally a crouching character. Ended up adding that funny feathered hat, the bow and all of the sudden it became Robin Hood. The size of the image is 3.5 x 5 inches. 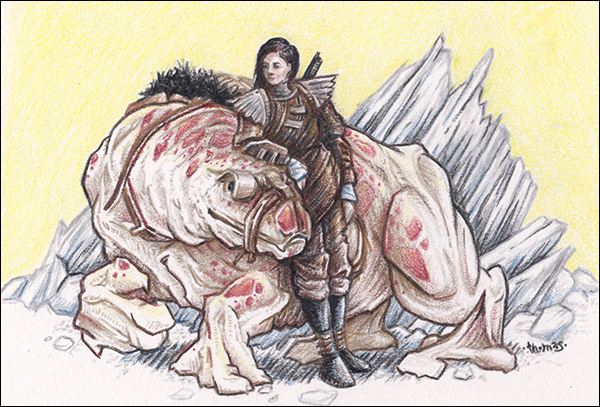 The Creature Rider – This image came from a really rough sketch as well. Just made up this creature and decided to make a female rider leaning on it. Made a rocky landscape background behind the creature so that it could use those big muscular feet. Gave the rider a leathery rugged looking outfit to match the creature. Lot of fun doing this illustration! 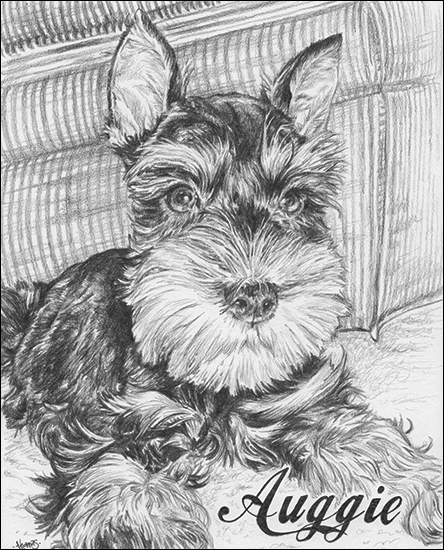 Size of the image was 4 x 6 inches and sold it at the show so it’s not for sale. 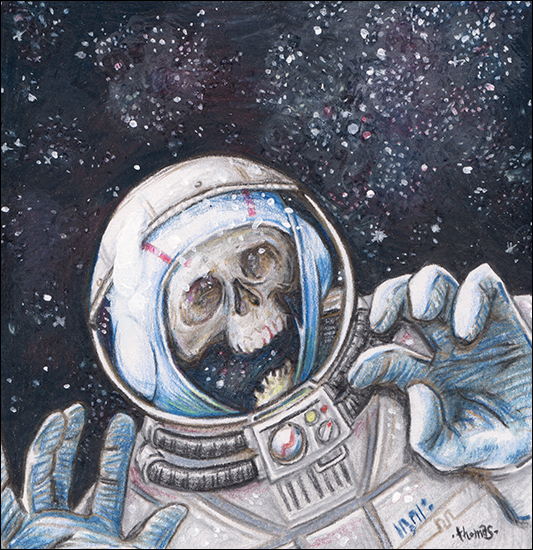 Space Madness – Wanting to do a space piece started sketching out a space suit and then decided to add a skull inside. It ended up looking kinda creepy and haunting. 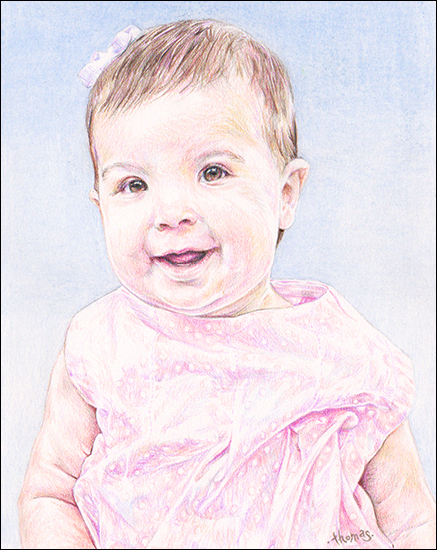 The illustration was done in colored pencil with white acrylic paint for the highlights and stars. Image size is 5.25 x 5.25 inches. Early Man vs. Extinction – This ended up being my favorite piece that I worked on. The initial sketch started out as a man with a bow over his prey. Took some reference poses of myself with a broomstick and then started on the final sketch. Made the hunter into a caveman looking character. Later decided to add the sabre tooth tiger coming to get an easy meal. Then started looking at deer and found a photo of an Irish Deer which was the biggest deer species but is now extinct. Hence the title and theme of the piece. 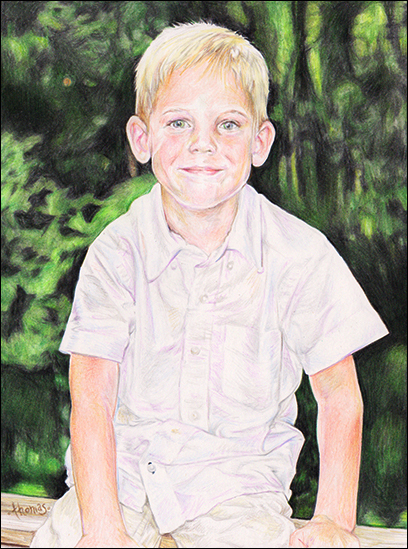 The artwork is done in colored pencil with white acrylic paint for the highlights. The dimensions are 9.5 x 5.5 inches. 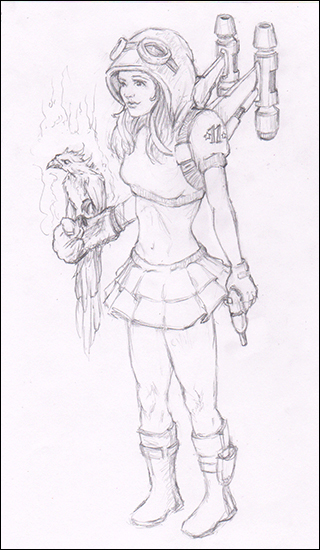 Rocket girl – This was done for an Artorder challenge using the Reckless Deck. Basically you take random cards and create artwork using those cards. 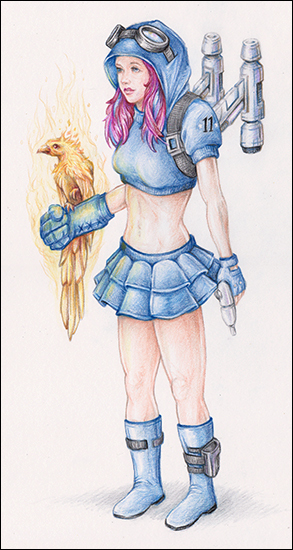 The random cards that were used for rocketgirl are Jetpack, Petticoat, Animal Companion, Laser Gun, and Fire Attributes. It definitely takes some thought to work all these into one piece of art. The dimensions are 6.5 x 12.25. I’ve included a pic of the initial sketch because I’m selling them together. Really enjoyed doing this new artwork and definitely am planning on doing more fantasy and sci-fi artwork in the future. 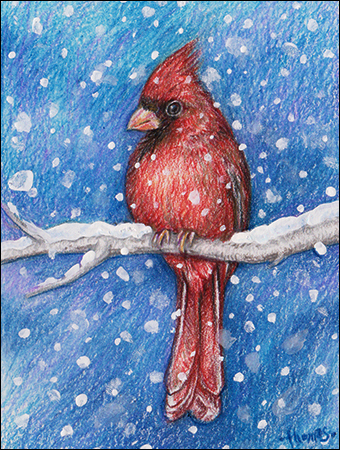 Would like to get in the habit of doing one personal creative little colored pencil piece a week. Hopefully so and will definitely try and post more on my blog. Taking requests for next weeks small drawings! Finished this portrait today. 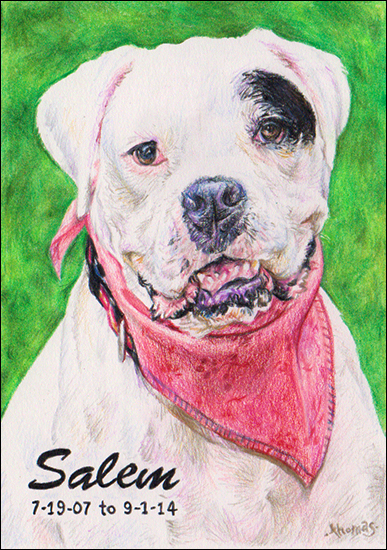 It’s of a dog named Salem and it is done in colored pencil. The dimensions of the portrait are 5 x 7 inches. Here is the newest illustration that I’ve finished. 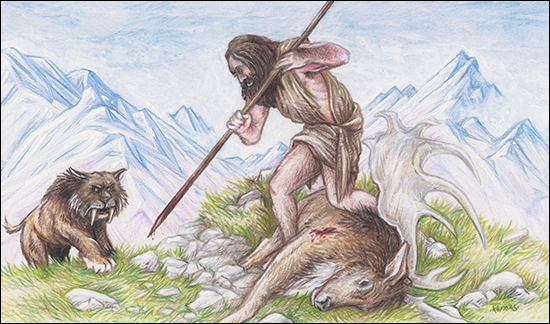 The illustration is done in colored pencil. 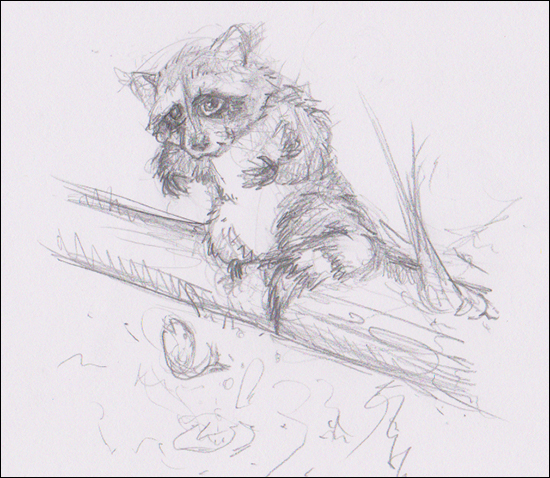 The drawing came about just doing some sketches of raccoons. 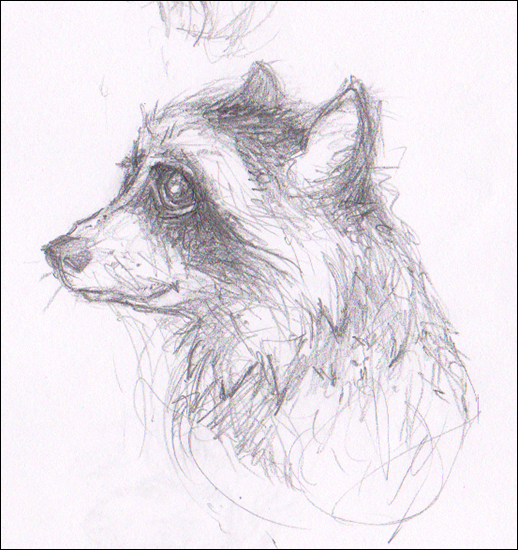 Was originally going for more of a head shot but ended up drawing the whole raccoon. Then decided on adding the log for the raccoon to sit on. 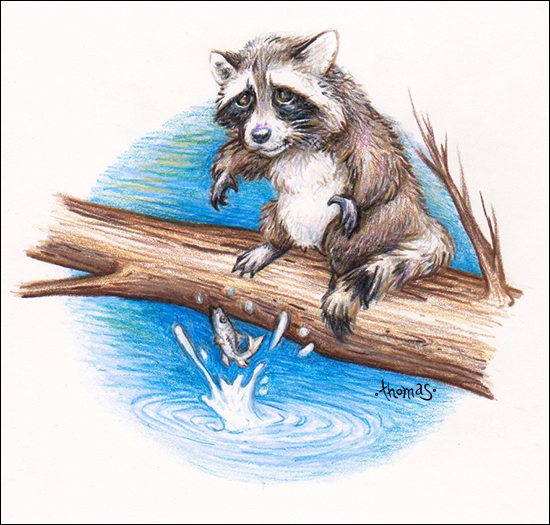 Thought that the pose of the raccoon looked like he was trying to catch something so added the jumping fish. Below are some of the sketches that transformed the artwork into what it is. Please visit www.whiterabbitart.com to view more of my artwork!